TOSS Jaw Bars can be custom made to lengths less than 3" and more than 240"
How to make a functioning Heatseal Jaw? 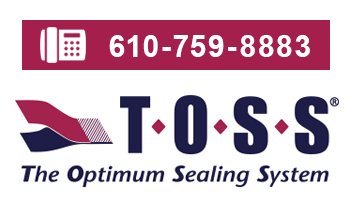 Pre-engineered, extruded aluminum, heatseal jaw bars from TOSS assure the precision straightness and uniformity required for making perfect seals. Single lengths are available up to twelve feet and can be connected easily for longer applications. 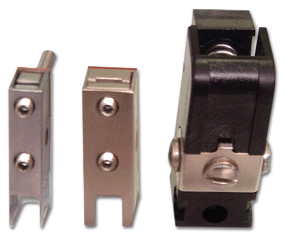 TOSS custom jaw bars are available with water-cooling capabilities and jaw end blocks designed to provide convenient mounting, tensioning, and electrical connection for heatseal bands of any length or size. Heatseal jaw design is relatively simple. 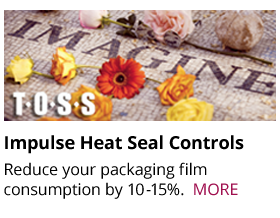 It is made even easier by the use of TOSS components that are available to facilitate the construction. Good sealing depends upon equal and even contact between the jaws for the full length of the jaws. 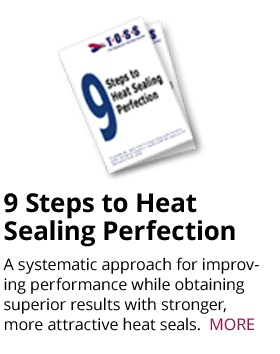 Sealing is accomplished when the seal area cools, therefore, the ability of the jaw bar to absorb heat is important (See STEP 3. Modes of Sealing). Aluminum is usually used in Heatseal Bars because it has a high specific heat and thermal conductivity as well as being light and easy to machine. Jaw Bars offered by TOSS include a cooling passage for the full length of the jaw bar. In most cases it is not needed, but additional cooling can shorten the cycle time by one or more seconds. 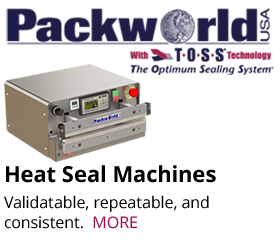 This time saving can be very important in high speed production. The quality of a seal is directly dependent upon the design and precision of the Jaw Bar Assembly. The old adage " form follows function" is very apropos in the case of the TOSS Jaw Bar Assembly design. must be straight and true with tolerances that are tighter than commercial bar material. must have sufficient mass to absorb waste heat in the cooling process.may require a cooling water passage in applications that are high speed or high temperature. must have a tensioning system that is electrically insulated and have sufficient force and travel to assure that the heatseal band remains taut when expanded. must have a tensioning system that is "error proof" to assure proper tension when heatseal bands are replaced and must have rugged low resistance terminals for power connections. 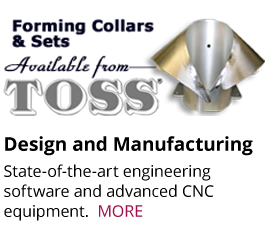 TOSS Jaw Bar Assemblies include a basic Jaw Bar, Jaw End Blocks, and Heatseal band. 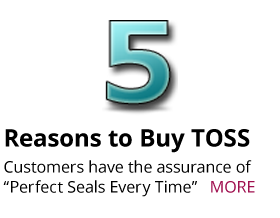 They, very conveniently, are built to meet all of the design criteria that are mentioned above. The basic aluminum jaw bar material is custom extruded by TOSS to assure precision straightness and uniformity. Available in up to twelve foot lengths (we can machine connections to yield longer bar systems), the extruded shape provides a water passage for use in the event it is needed. The sealing face of the jaw has a retaining recess for the insulating underlayment (Durit) that is situated beneath the heatseal band or the silicone rubber Jaw Form Strip that is used on the opposing jaw. Jaw bars are fabricated to the length required for the individual application. Tensioning and electrical connection to the heatseal band is accomplished by the TOSS Jaw End Blocks. 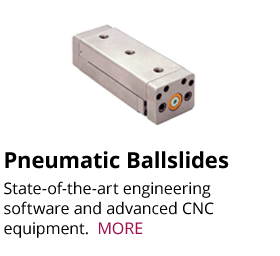 These Jaw End Blocks are designed to interface with the Jaw bar at its ends. They are molded of temperature resistant polymer and have tensioning springs built in. They are attached by a threaded screw that is an integral part of the Jaw End Block assembly. The blocks also have the screws needed to attach the heatseal band and the power wires. An important part of the Jaw End Block design is an alignment pin that holds the heatseal band in position, facilitates band attachment, and assures that the band is properly positioned and tensioned. To cool or not to cool, this is sometimes the question. Some systems use water-cooled jaws as a means of maintaining the jaw at a relatively constant temperature. These systems then, may demand an excessive amount of energy to overcome the heat loss into the cooled jaw. When a water chiller is utilized, excessive cooling is often the case. Cooling below the dew point will result in undesirable moisture condensation on the jaws, particularly in humid environments. When using high response temperature control, the controller supplies only enough heat to make the seal. Much of the heat is carried away by the material that has been sealed, the remainder is not too great and will be absorbed by the mass of the aluminum Heatseal Jaw Bar. If the jaw bar gets warmer during prolonged operation, the controller will continue to sense only the actual temperature of the Heatseal Band and will automatically reduce the amount of energy to the band; thereby assuring that the band temperature during each impulse cycle is always the same. When doing impulse sealing at high speeds, 50-60 or more seals per minute, cooling of the Heatseal Jaws can be helpful in accelerating the cooling cycle. This reduces the time required for the seal to set and permits operation at higher speeds. Some polymeric materials, like polypropylene, may become brittle when cooled too rapidly. It is, therefore, important to know the character of the film before developing a processing protocol for sealing it. The skillful use of water that is temperature controlled can be a valuable aid when the investment is justified by greater productivity. 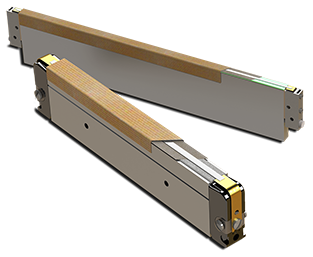 A cooling passage is included in TOSS Heatseal Jaw Bars as a standard feature. It is there if it is needed. In any event, if one elects to use cooling water, it is imperative that the Heatseal Jaw not be over-cooled. A carefully calculated balance must be maintained between the time required to heat the seal and the time required to cool it. Air cooling is occasionally employed to accelerate the cooling of the heat sealed material. This technique is more often utilized to cool seals that have been made by the constant heat mode. Click here to see all four possible configurations of jaw bar designs.